Autumn Planting – Dig Delve – An online magazine about gardens, landscape, growing & making. It has been an exciting autumn, and one that I have looked forward to and been planning towards for the past six years. It has taken this long to resolve the land around the house. First to feel the way of the place and then to be sure of the way it should be. Though the buildings had charm, (and for five years we were happy to live amongst the swirly carpets and floral wallpapers of the last owner) the damp, the white PVC windows and the gradual dilapidation that comes from years of tacking things together, all meant that it was time for change. Last summer was spent living in a caravan up by the barns while the house was being renovated. We were sustained by the kitchen garden which had already been made, as it provided a ring-fenced sanctuary, a place to garden and a taste of the good life, whilst everything else was makeshift and dismantled. This summer, alternating between swirling dust and boot-clinging mud, we made good the undoings of the previous year. 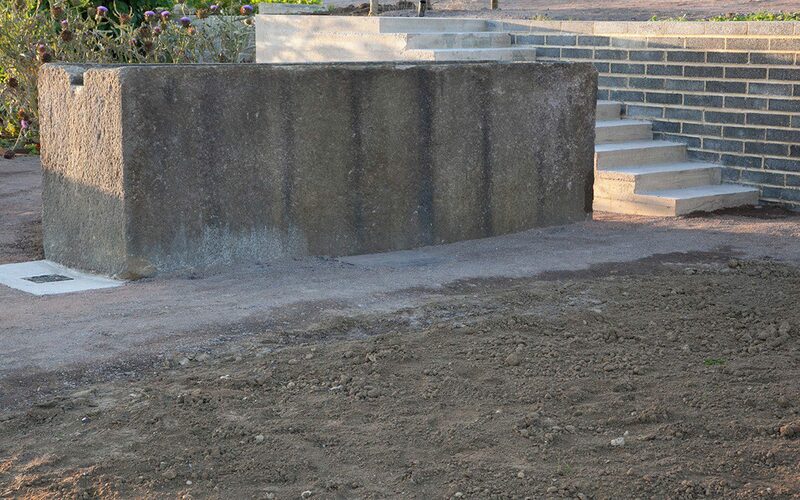 Rubble piles from construction were re-used to make a new track to access the lower fields and the upheavals required to make this place work – landforming, changes in level, retaining walls and drainage, so much drainage – were smoothed to ease the place back into its setting. The plateau of the kitchen garden to the west has been extended and between the troughs and the house is a place for a new herb garden. Sun-drenched and abutting the house, it is held by a wall at the back, which will bake for figs and cherries. The wall is breezeblock to maintain the agricultural aesthetic of the existing barns and, halfway along its length, I have poured a set of monumental steps in shuttered concrete. 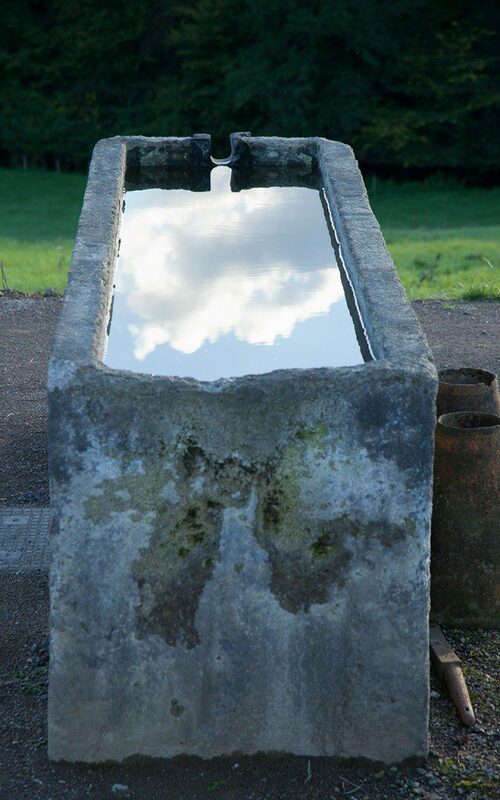 They needed to be big to balance the weight of the twin granite troughs and, from the top landing, you can now look down into the water and see the sky. On the lower side of the new herb garden, continuing the bank that holds the kitchen garden, the landform sweeps down and into the field. Seeded at an optimum moment in early September, it has greened up already. Grasses were first to germinate, and there are early signs of plantain and other young cotyledons in the meadow mix that I am yet to identify. I have not been able to resist inserting a tiny number of the white form of Crocus tommasinianus on the brow of the bank in front of the house. There will be more to come next year as I hope to get them to seed down the slope where they will blink open in the early sunshine. 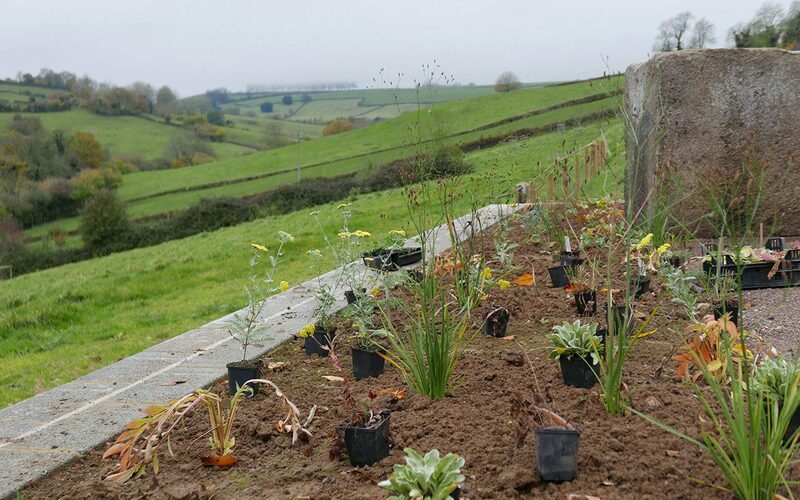 I have also plugged the banks with trays of homegrown natives – field scabious (Knautia arvensis) and divisions of our native meadow cranesbill (Geranium pratense) – to speed up the process of colonisation so that these slopes are alive with life in the summer. 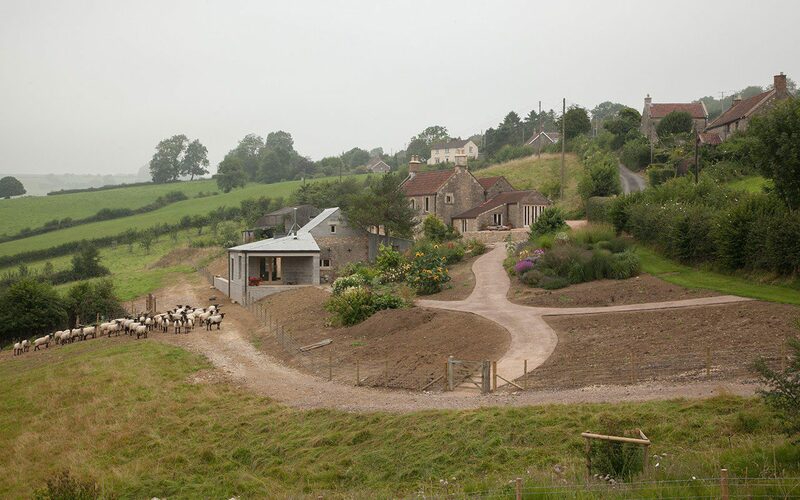 Below the house, the landform divides to meet a little ha-ha that holds the renovated milking barn and a yard which will be its dedicated garden space. This barn is our new home studio and from where I am planning the new plantings. 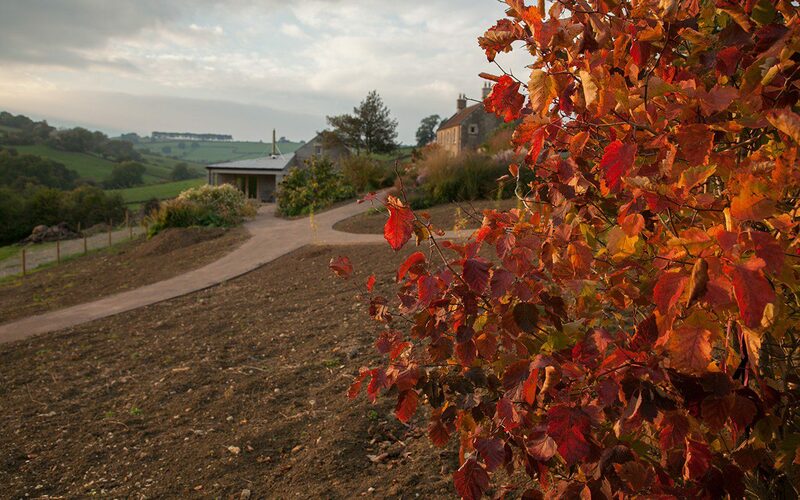 I have placed a third stone trough in this yard – aligned with those on the plateau above – with a solitary Prunus x yedoensis beside it for shade in the summer. There are pockets of soil for planting here but, beyond the two weeks the cherry has its moment of glory, I do not want your eye to stop. This is a place to look out and up and away. That said, I have been busily emptying my holding ground of pot grown plants that have been waiting for a home, and some have gone in close to the milking barn to ground it; a Hamamelis x intermedia ‘Gingerbread’ from the old garden in Peckham, a Paeonia rockii, a gift from Jane for my 50th, and the beginnings of their underplantings, including Bath asparagus and some favourite hellebores that I’ve had for twenty years or more. The spaces here are tiny and they will need to work hard so as not to compete with the view out, nor disappoint when you get up close on your way to the barn. 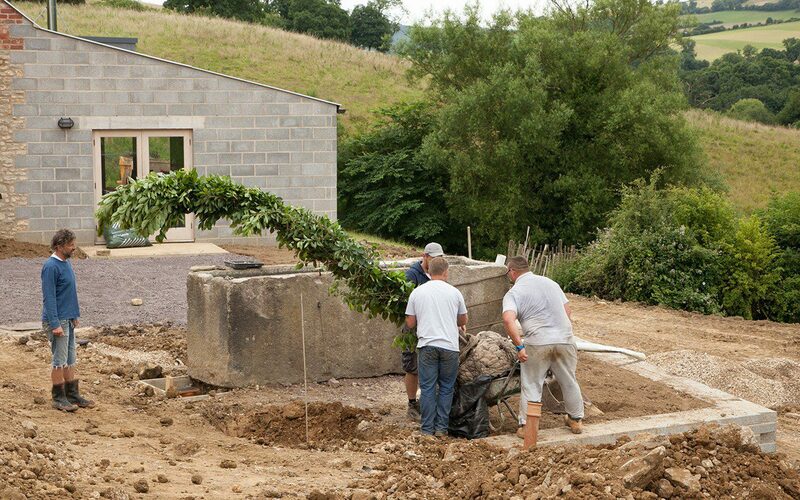 The bank sweeps up to wrap the milking barn above and to the east and the planting with it, so that it is nestled in on both sides. Below the barn there is the contrast of open views out into the fields, so when inside I can keep a clear head from the window. To help me see my new canvasses in the new ornamental garden clearly I have started dismantling the stock beds. The roses, which have been on trial for cutting, will be stripped out this winter and the best started again in a small cutting garden above the kitchen garden. I’ve also been moving the perennials that prefer relocation in the autumn. Jacky and Ian, who help in the garden, spent the best part of a day relocating the rhubarbs to the new herb garden. It is the third time I have moved them now (a typical number for most of my plants), but this will be the last. In our hearty soil, they have grown deep and strong and the excavations required to lift them left small craters. 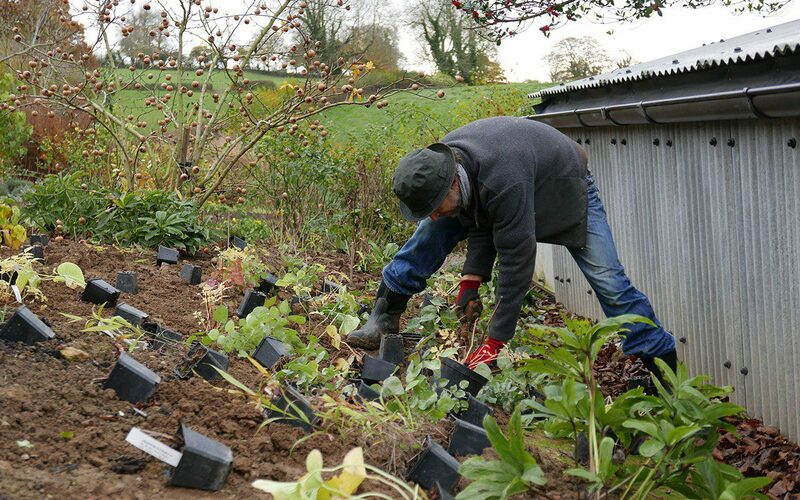 The perennial peonies, which go into dormancy in October, also prefer an autumn move, as do the hellebores so that their roots are already established for an early start in the spring. They both had a firm grip and I had to lift them as close to the crowns as I dared so that they were manageable. The hellebores have been found a new home in a rare area of shade cast by a new medlar tree that I planted when the landscaping was being done. I rarely plant specimen trees, preferring to establish them from youngsters, but the indulgence of a handful, which included the cherry and a couple of Crataegus coccinea on the upper banks near the house, have helped immeasurably in grounding us in these early days. To enable a July planting these were all airpot grown specimens from Deepdale Trees which, as long as they are watered rigourously through the summer, establish extremely well. 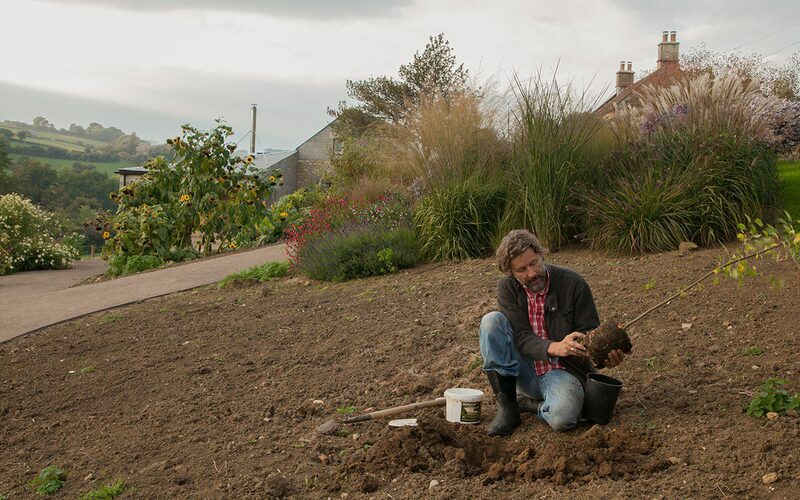 Usually right now is my preferred (and the ideal) time to plant anything woody. Planting seed-raised Malus transitoria in the new garden in October. 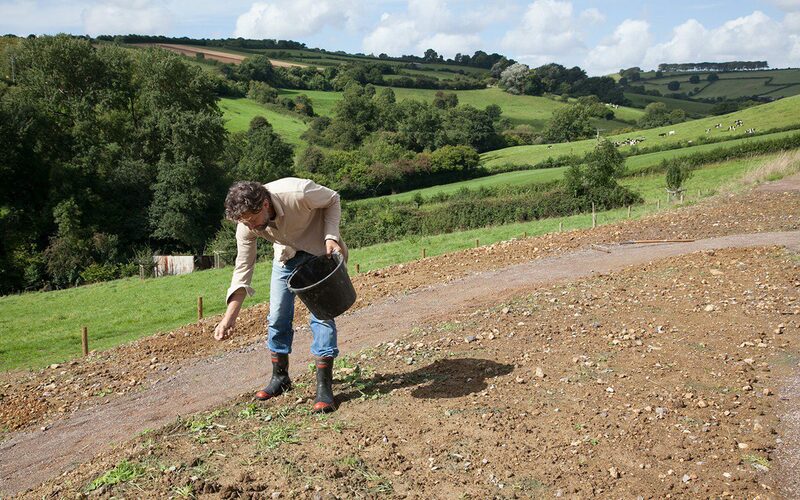 In the background are the trial and stock beds, which are gradually being dismantled. The best trial plants will be divided and used in the new plantings. It is such a good feeling to have been planting things I have raised from seed and cuttings for this very moment; a batch of seedlings grown on from my Malus transitoria to provide a little grove of shade in the new garden, rooted cuttings of Salix purpurea ‘Nancy Saunders’ to screen the new garden from the field below, and a strawberry grape (Vitis vinifera ‘Fragola’), a third generation cutting from the original given to me thirty years ago by Priscilla and Antonio Carluccio, is finally out of its pot and on the new breezeblock wall. Close to it I have a plant of the white fig (Ficus carica ‘White Marseilles’), a cutting from the tree at Lambeth Palace, where I am currently working on the landscaping around a new library and archive designed by Wright & Wright Architects. The cutting was brought from Rome by the last Roman Catholic Archbishop of Canterbury, Cardinal Reginald Pole, in 1556. In 2014 a cutting made the return journey to Pope Francis, a gift of the current Archbishop of Canterbury, Justin Welby. The tree reaches out from the palace wall in several directions to touch down a giant’s stride away. It is probably as big as our little house on the hill, and my cutting is full of promise. It is so very good, finally, to be making this start.